Facebook really wants us to use Messenger. For the most part, they've succeeded; theirs is one of the most popular messaging apps right now. And with yesterday's announcement of new features, Facebook is only going to make their flagship chat application better. Well, maybe. We've broken down all the new features released yesterday. Some have potential. Others ... not so much. If you want to know what's good and what's not with the new Messenger, you've come to the right place. The new Discovery section acts almost like an app store, but for bots. Here, users can see their own recently used bots, as well as browse trending bots and suggested ones that Facebook thinks will be relevant to the user. Discovery sounds like either a potential win, or, at the very least, not a big problem. If bots aren't your thing, or they don't work very well for you, you need not pay attention to the Discovery section. However, if you like using bots, this may be a helpful way for you to expand your collection — especially if Facebook's algorithms can match you with bots you might actually find useful. Plus, Facebook won't allow developers to submit their bots to Discovery unless they have provided a short summary of what the bot actually does. That means you will always get a preview from the developer before choosing to use their bot to cut down on any surprises or letdowns. Chat extensions are an interesting invention. Bots can now take your conversations with other Facebook users and insert themselves into the discussion, providing information or entertainment based on what is being said. On the one hand, there is potential for this to be useful. If someone asks a question, say, "what is the movie theater's address?" a bot may be able to automatically enter that information into the chat, saving precious seconds of Googling. For Reddit users, this feature may be familiar for those who frequent subreddits where bots have been deployed to interact, and sometimes correct, users. On the other hand, this sounds downright creepy. We're no strangers to the lack of privacy we have on the internet, but the idea of willingly giving our conversations over to bots that are "listening" every step of the way isn't overly comforting. 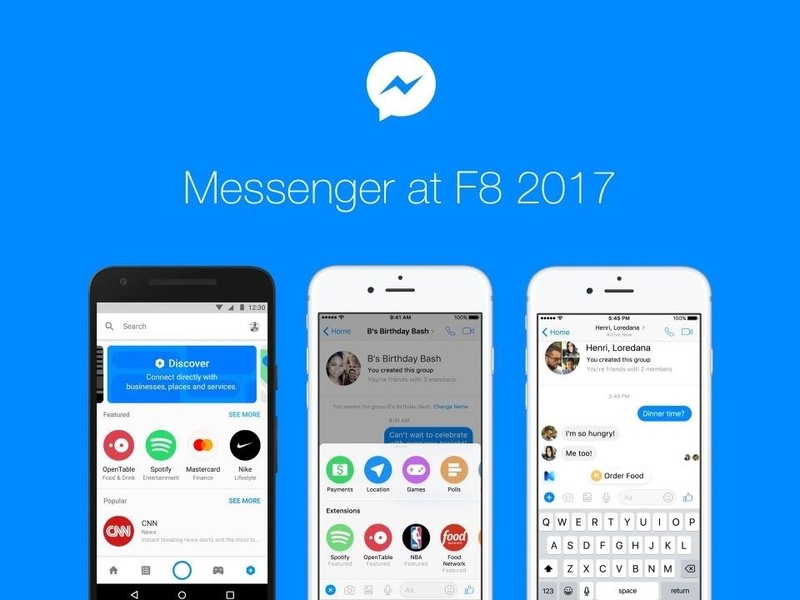 Facebook is planning to integrate different kinds of codes, like QR codes, into messengers that the bots will be able to scan. This is primarily targeted as a way to better connect businesses with customers. It's possible this technology could be used for multiple purposes, from advertising, to a location-based delivery system, such as like what some sports arenas have done with their concessions. The problem with this move is that QR codes are just not very practical. Businesses have to physically place these codes out in the real world; and as we move more into digital technology, such as AR, there just isn't much use for codes like that. Links work just as well. If you need further proof as to why QR codes are awful, take a moment to watch marketing expert and author, Scott Stratten, explain why he hates QR codes as much as we do. Similar to chat extensions, M is Facebook's "assistant" who is always listening in on your conversations. Ideally, this is to provide you with helpful information, but who knows what else they're doing with the data they process. Being optimistic, though, an example of M's role in your conversations could include the assistant recommending you different bots, businesses, or Facebook utilities to solve a problem you're discussing. M sounds a bit like a more personalized Siri, possibly providing useful suggestions to your daily needs and questions. But as mentioned, just like chat extensions, this "always listening" trend from Facebook corporate is unnerving. Facebook wants to integrate these "useful" tools into its product suite, but if they insist on doing so, maybe they should provide an optional off switch as well for those concerned about their privacy. Get ready for turn-based gameplay in Messenger. Unless you don't like turn-based games. Then you don't have to play them. Facebook will be integrating these types of games (we've gotten a taste of these before with their soccer, basketball, and chess hidden games), as well as game bots, into Messenger. If you like playing games inside messaging apps, this feature will be for you. Otherwise, you can easily just skip it. Facebook is giving businesses the tools to integrate bots into their online customer service protocols. This will allow businesses to give automated responses through bots to customers with frequently asked questions. Double Exposure Challenge: All Mod Cons.